What If...? Volume 2 #32, cover date December 1991, release date October 15, 1990. The various What If series were always a fun read. Tales told by the Watcher asking the question, what if things happened this way instead of the way it did. What if style discussions go hand in hand with being a comic book fan and have been known to bring on epic debates of monumental proportion. 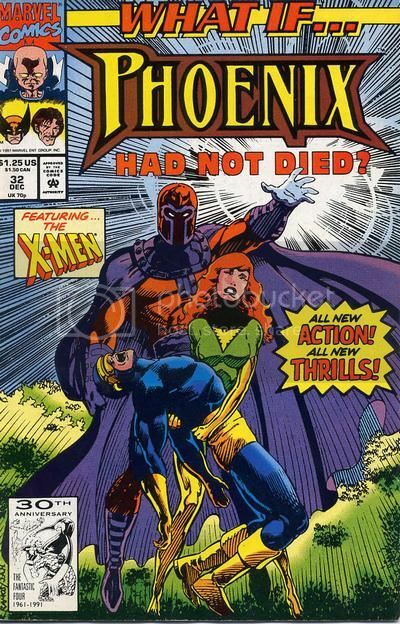 In this issue the question asked is, what if Phoenix had not died? In typical fashion for this series, we get a rundown from the Watcher of what really happened as we know it and he then sets the stage for the story. In this particular what if, the Phoenix was captured by the Imperial Guard of the Shi'ar Empire before she was able to kill herself. What we are told is that while in custody of the Shi’ar, Phoenix is given a psychic lobotomy which removes her abilities but leaving her with the memories of the crimes she committed. In the aftermath, Scott (Cyclops) and Phoenix leave the X-men to live their own lives. Phoenix has difficulty adjusting to life without her powers and the billions of lives she’s extinguished. Scott wakes up finds Phoenix gone. Sitting on the couch smoking a cigarette is Phoenix, who tells Scott that she doesn’t want to go bed. During their conversation however, Scott finds a bottle sleeping pills and has asks to himself why she would have them. As the couple talk they head to the balcony and are soon interrupted by Magneto who is there for Phoenix. Scott and Magneto go at it when Phoenix decides to give herself up in exchange for Scott not getting pummeled to death. Phoenix is taken to Magneto’s base, Asteroid M orbiting Earth. Magneto tries to play it nice but Phoenix is not in the mood for it demanding that Magneto get to the point of why he abducted her. Magneto has the means to restore her abilities by means of a device that he created trying to convince her that Scott and the X-Men betrayed her, claiming that the two of them should be working together. Scott meanwhile rounds up the X-Men and head into orbit to rescue Phoenix from Magneto. They put the blackbird on autopilot to distract Magneto while they use a smaller asteroid to crash into the base and get inside. The heroes track down Magneto and the fight begins. As the battle is happening Phoenix questions if she should use Magento’s device to restore her powers. She see’s her friends taking on Magneto and chooses to turn down the power and begins to smash the machine, catching Magneto’s attention. Angered that Phoenix has turned down his offer, he allows the X-Men to leave in peace. After returning to Earth, Phoenix and Scott move back into the mansion. Scott rejoins the X-men and Phoenix goes off to college, not long afterward, their daughter Rachel is born and Phoenix becomes the mentor for the New Mutants. During the time that the heroes and villains of the world were missing (Secret Wars), Phoenix is assaulted by Mastermind who is being controlled by the Shadow King, who wants to use Rachel as his host body. Phoenix tries to fight back but is shot several times by Mastermind who takes off with the baby. Lying on the floor dying, the full extent of the phoenix force re-emerges and Phoenix realizes that her entire life has been a lie ever since she adopted the human form of Jean Grey. Phoenix flies off to where she placed Jean in a protective cocoon, She contemplates what her life would be like if she told the truth and with a stray thought, Phoenix kills Jean Grey, not even realizing what is happening until it is already over. The issue ends there an leads into the next issue, What if the Phoenix Rose Again. The Phoenix Saga and Dark Phoenix Saga are two of my favorite X-Men stories, I was more than happy to read a “what if” approach to the story. Rod Ramos is no John Byrne put he did an excellent job of capturing the X-Men of 1980. This one should be easily found in bargain bins, it is a fun read especially if you have the following issue to go with it. Up next, What If...? #33 What If The Phoenix Rose Again?